After the miraculous sequence of events in the NFC Championship Game, the question must be asked; are the 2014 Seattle Seahawks a team of destiny? A win this week will absolutely answer that question with a resounding ‘yes.’ The two-time defending NFC Champion Seahawks face off against the AFC Champion New England Patriots in Super Bowl XLIX. With a win, it will mark the 9th time in NFL history a team has repeated as world champions and the first since the 2003-2004 Patriots. The all-time series between these two teams is tied 8-8. Their last meeting has re-emerged in the media in recent days as preparation for Super Bowl XLIX continues. In that October 2012 meeting, Seattle erased a 13 point fourth quarter deficit and came back to beat the Patriots 24-23. That game arguably launched the future success of this entire team, as the Seahawks have posted a 38-11 record since. This game is perhaps more well known for the postgame episode between Seahawks cornerback Richard Sherman and Patriots quarterback Tom Brady in which Brady told Sherman and Earl Thomas to see his after the game (when New England won). The Seahawks instead walked off the field victorious and shortly after the game Sherman posted a picture of him loud-mouthing Brady postgame with the caption “You Mad Bro.” A lot has changed since that rainy fall day two seasons ago. Here is what I will be looking for in Super Bowl XLIX. Russell Wilson: Last week the Seahawks offense shied away from the read-option until late in the game, which is when our offense had the most success. In regards to the read-option I have the same mindset this week that I did before Super Bowl XLVIII. This is the last game of the season and regardless if we win or lose we are going home no matter what. Why not completely open up the playbook and let Russell Wilson run free? 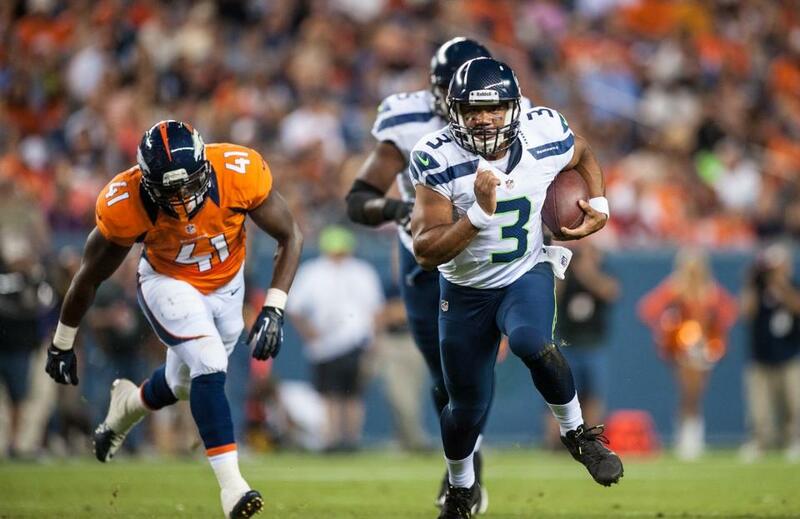 Wilson has rushed for over 50 yards in six games this season. The Seahawks are 4-2 in those games, losing the two games by a combined 6 points. The Seahawks have not played a game this season where Russell Wilson keeping the ball is a top offensive priority so I do not expect the Seahawks to use a lot of read-option in the first part of this game. If the Seahawks get off to a slow start it would not surprise me to see offensive coordinator Darrell Bevell call more read-option plays rather than be patient to see if we can work out our potential offensive problems. Offensive Matchup to Watch: RB Marshawn Lynch vs. Patriots DT Vince Wilfork. In reality the matchup I really want to see is Beast Mode against the entire New England defensive line but of all Patriots defenders I think Wilfork could give Lynch the hardest time. Wilfork leads all Patriots interior linemen in tackles with 47 on the season and his ability to penetrate the offensive line is uncanny. He may not show up in the stat sheet regularly but his ability to overpower the offensive guard forces the opponents running game to the outside. Lynch thrives off of being able to run through the middle of the field and gain yards after contact. Running to the outside could be the most effective strategy for the Seahawks to pick up yards on the ground. Wilfork could be the reason why we see the Seahawks use both Lynch and Russell Wilson in the running game on the outside. Defensive Matchup to Watch: SS Kam Chancellor vs. Patriots TE Rob Gronkowski. The only Seattle defender that could possibly cover New England tight end Rob Gronkowski one-on-one is Chancellor. I believe the possibility of Chancellor delivering one of his signature “Bam Bam” hits to Gronkowski would be worth the price of admission. I want to see two things out of the Seahawks defense this week. The first is an expanded “big nickel” package. With Gronkowski mostly playing in the slot, I want to see Chancellor line up at nickel corner instead of Jeremy Lane or Tharold Simon and for the Seahawks to bring reserve safety DeShawn Shead on as an extra safety playing in Chancellor’s normal spot. This would give the Seahawks a 4-2-5 defensive look which will allow the Seahawks to rush four defensive linemen while also adding an extra blanket of coverage on Gronkowski. The second thing I want to see is something that we have struggled to do in the playoffs; put pressure on the quarterback. Tom Brady is a pure pocket passer who does not tend to scramble. The Seahawks need to use the likes of O’Brien Schofield, Bruce Irvin, and Malcolm Smith in interior blitz packages to overwhelm Brady. If the Seahawks can sack Brady three times and hold Gronkowski to limited catches the Seahawks will have put themselves in a great position to win this game. Patriots X-Factor Player(s) to Watch: All the talk this week in regards to the New England running game is how the Seahawks are going to be able to corral running back LeGarrette Blount. What’s to say Blount is even the feature back on Sunday? The Patriots have several weapons on the ground at their disposal and that is where I put my X-Factor spotlight for Super Bowl XLIX; on running backs Jonas Gray, Shane Vereen, and Brandon Bolden. Patriots head coach Bill Belichick has been known to be very hot-and-cold when it comes to which personnel to use. Gray, Vereen, and Bolden have combined for 842 yards and 8 touchdowns this season. 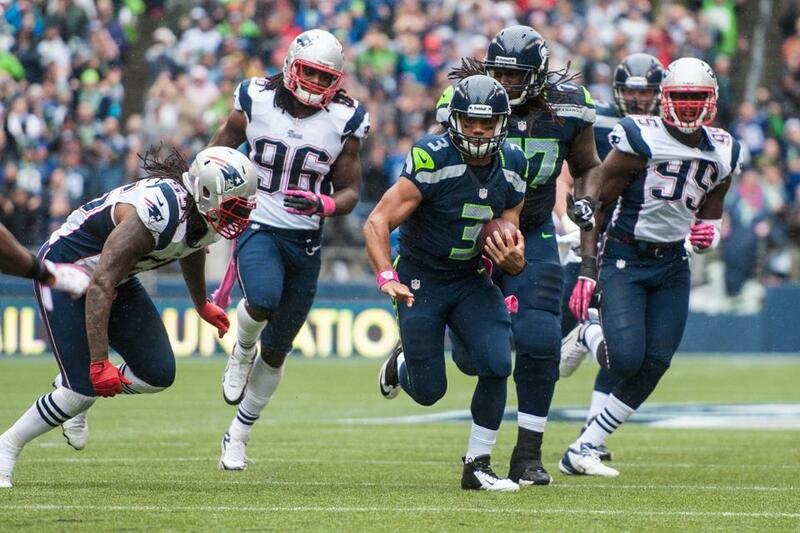 I believe Vereen would give the Seahawks the most trouble out of these three as he plays the most versatile game. Blount, Gray, and Bolden are all physical runners that I believe the Seahawks defense would have an easier time containing. For as good of a game Blount had in the AFC Championship Game I believe there is a good possibility we will not see Blount as the primary running back and instead we could see one of New England’s three other backs. Comparisons to the 2013 Broncos: Many of my friends have asked me how the 2014 Patriots compare to the 2013 Broncos whom we beat in last year’s Super Bowl. Here is my quick take on this subject. On offense no team is going to be much better than last year’s Broncos, who set records left and right. Historically, the 2013 Denver Broncos are the best offensive unit in NFL history so this year’s Patriots are obviously not as good as the offense we faced last year. I do believe however that this year’s Patriots defense is better than last year’s Broncos defense, which is why this Super Bowl will be a tougher game for the Seahawks to win. Last year the Broncos allowed an average of 24.9 points per game while the 2014 Patriots are only allowing an average of 19.5 points per game. Since New England has the better defense, I have to say that I believe that overall the 2014 Patriots are a better team as a whole than the 2013 Broncos. Random Thoughts: The Seahawks are the designated home team in this year’s Super Bowl so we will be wearing our navy blue home jerseys this week. We will likely wear our navy pants and I would be stunned if we wear white or wolf grey pants. The Patriots will wear their white jerseys and navy blue pants; the first time they have worn that combination in a Super Bowl since Super Bowl XXXIX… Al Michaels, Cris Collinsworth, and Michele Tafoya have the call for NBC this week. NBC will broadcast 5 hours of pregame coverage starting at 10am Sunday morning… Bill Vinovich is the referee for Super Bowl XLIX, his first. Vinovich officiated one Seahawks game in 2014; our 24-14 win over Philadelphia in December… For the first time ever the Seahawks are playing in a Super Bowl in a warm climate. I cannot wait to get my sunburn on down in Phoenix this weekend. It will be nice to escape the 50 degree weather and the rain for a few days and be able to walk down the street in a t-shirt and shorts in the evening… Two words to describe the price of ticket prices for this year’s Super Bowl: holy cow. If you don’t have an idea, go check StubHub right now… I am staying two miles away from University of Phoenix Stadium so I will likely just walk to the game on Sunday. That will be a nice change from taking two trains to and from New Jersey last year and getting back to Manhattan after 2am… I hope the weather does not cooperate on Sunday. Bad weather would force stadium officials to close the stadium’s roof. The current plan is for the roof to stay open for the game but inclement weather would force them to keep the roof closed. That would be a significant advantage for the Seahawks. I would like the building to be as loud as possible… Last season in New York the 12th Man made a lot of noise at MetLife Stadium. It makes me wonder how the 12’s will travel this year since the Super Bowl is being played closer to home. Phoenix is significantly closer to Seattle than the New England area so I would not be surprised to see the overwhelming majority to be Seahawks fans. I think more Seahawks fans will be at this game than last year’s game… With a win the Seahawks would become the 13th NFL franchise to win multiple Super Bowls. The teams we would tie with 2 championships would be the Broncos, Dolphins, Colts, and Ravens… Last year in New York I met/got pictures with no celebrities which was a disappointment. This year I have to see and meet celebrities. I would honestly settle for just one picture with someone famous… I do not think we can start “dynasty” talk if we win this game just yet, but knocking off Peyton Manning and Tom Brady in back-to-back Super Bowls would be unbelievable. Prediction: The game balls will be properly inflated. This will absolutely NOT be a 43-8 shellacking like last season however that doesn’t mean the Seahawks will lose this time around. The Seahawks defense will hold the Patriots offense to under 300 total yards and Tom Brady will fail to throw for a touchdown for the first time in his Super Bowl career. Marshawn Lynch will run for 85 yards and a touchdown while Russell Wilson throws a touchdown to Jermaine Kearse. Lynch will win Super Bowl MVP and the Seahawks will head back to Seattle with their second Lombardi Trophy in as many seasons. I will be back from Arizona Tuesday night. Check back late Tuesday night or early Wednesday morning for my Super Bowl XLIX review. Enjoy the game everyone and to those lucky enough to attend, enjoy this moment because you do not know when this opportunity will present itself again. Go Seahawks! The Seattle Seahawks have the opportunity this week to prove one of head coach Pete Carroll’s most well-known mantras right; it’s not how you start, it’s how you finish. The Arizona Cardinals have been the top dogs in the NFC West all season long and the Seahawks have the chance to knock them off their throne and take full control of the division. In front of a nationally televised audience on NBC’s Sunday Night Football the Seahawks will take on the Arizona Cardinals in what some people are calling the biggest regular season game in Cardinals history. Arizona is 11-3 and Seattle is 10-4. A Seahawks win would give both teams an 11-4 record with Seattle taking the division lead based on the head-to-head tiebreaker they would have over Arizona. A Cardinals win clinches the NFC West and home-field advantage for themselves. This is without a doubt the biggest game of the season and many of the matchups definitely favor the Seahawks. In a game that should be filled with dominant defense, this game will likely be won and lost and the hands of the offenses, which is where I put my primary focus for both teams this week. Here is what must happen on Sunday for the Seahawks to take over first place in the NFC West. There are two things I am looking for out of the Seahawks offense on Sunday. First is we need to get off to a fast start by scoring early points. Two of the top defenses in the league will be featured in this game and points may be at a premium all night long. The best way to do this is to try to establish the run with Marshawn Lynch. If Seattle is unsuccessful running the ball, the best option in the passing game may be to use all sorts of quick passes, screens and slants in particular. 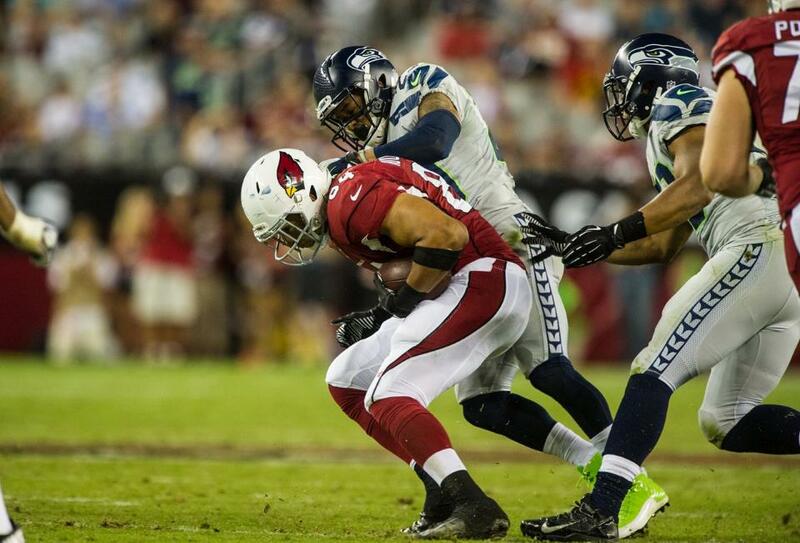 In his last 3 games against the Cardinals, quarterback Russell Wilson has been sacked 14 times. The Seahawks cannot afford to move backwards via sacks in this game. If the Cardinals front-seven does a good job penetrating the Seattle offensive line early on, my hope is to see Wilson use his legs more than usual to pick up yards and use quick passes to take the pressure off of himself. There a lot of negatives that I take out of Ryan Lindley’s game. He is a very inconsistent player who struggles doing the most fundamental aspects of the quarterback position. Lindley’s most glaring weakness is that he stares down his receivers, almost as if he predetermines which receiver he is going to throw to. Lindley also struggles reading the rest of the field, oftentimes unknowingly throwing into double or even triple coverage. This could mean big things for the Legion of Boom, as they thrive on reading the quarterback’s eyes to get in position to make a play. Lindley is a traditional pocket passer and he cannot throw on the run to save his life. He is very inaccurate outside of the pocket and even struggles mightily at times hitting receivers in stride from inside the pocket. If Lindley is going to have any success moving the ball the Cardinals will have to throw similarly to how I think the Seahawks should approach the passing game; with short passes and screens. In 7 games, Lindley is 2/27 on passes that travel 15 or more yards in the air (7.4% completion percentage on deep throws). There are two things the Seahawks defense can do that I think can shut Lindley down. If the Seahawks stack the box with 7, 8, or even 9 defenders and send heavy blitzes, Lindley will be flustered easily and may make horrible throws. This is the approach Rex Ryan’s Jets took in a game against Lindley in 2012 and he finished with a 32% completion percentage, 72 passing yards, and one interception. The Cardinals only scored 6 points in that game. The other thing the Seahawks can do is play press coverage on the outside all game long. If the defense plays zone, you are basically giving Arizona free yards and Lindley can take advantage on quick out routes and curls on the outside. Press coverage would eliminate the cushion Lindley would have to make throws to his receivers. I am curious to know how short Ryan Lindley’s leash is. If he struggles early will Cardinals head coach Bruce Arians pull the plug and replace him with rookie Logan Thomas? Arians stated early this week that they will implement a package of plays for Thomas but he did not go into details. If the Cardinals start ice cold on offense I think it is possible Arians will try to pull several tricks out of his hat, including using cornerback Patrick Peterson in wildcat formations. With Peterson already a dominating defender, the threat of his speed making an impact on the offensive side of the ball makes him my X-Factor player to watch for the Cardinals this week. I would not be surprised to see Peterson play both ways on Sunday and I do not think it is crazy to think he will see an expanded role on offense to get the running game going. Random Thoughts: The Seahawks will wear white jerseys on Sunday but it is unclear once again what color pants we will wear. I personally hope we wear blue pants… It is my opinion that the Cardinals will ditch their traditional red jerseys for this game and will instead wear their black alternate jerseys. They usually wear black twice per year (as NFL uniform rules permit) but they have only worn them once in 2014. With this being their last home game, I would not be surprised at all to see Arizona wear black jerseys and white pants this week… Al Michaels will provide the play-by-play and Cris Collinsworth will provide commentary for NBC this week. Michele Tafoya will report from the sidelines… This is the first Sunday Night Football game the Seahawks will play on the road since playing at Tampa Bay in 2008. (This season’s game on Thanksgiving does not count towards this stat)… Walt Anderson is the referee this week… Sunday is going to be a long and tense day leading up to kickoff. 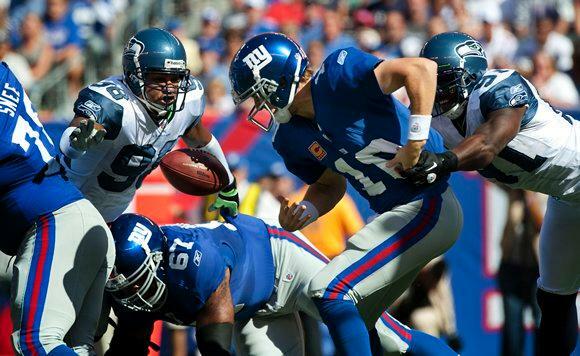 I don’t think I’ll be nervous, but I’ll just want the game to start already… Last December the Seahawks played the Giants at MetLife Stadium with the hopes that they would make a return trip for the Super Bowl in the coming weeks. The Same goes this week. You can’t tell me it won’t be discussed among the players and staff that the goal is to get back here [to Arizona] next month for Super Bowl XLIX… I was considering going down to Arizona for this week’s game over the summer. I should have made the investment. My hope was to have all of my Christmas shopping done and all my presents wrapped so I could head down to the valley of the sun and spend a nice relaxing weekend in the warm weather, down by the pool with a drink in hand, and watch the Seahawks play. Looking forward to doing all that is we make it to the Super Bowl!… It will be interesting to see what kind of home-field advantage the Cardinals have this week. Last season the 12th Man invaded University of Phoenix Stadium and made it their own. My hope is that the same thing happens this week. Are we going to see the biggest regular season game in Cardinals history and not have their own fans show up in full force and in full throat? Look at the second deck of the stadium, particularly the corners of the second deck and we’ll have the answer to that question. Seahawks Playoff Outlook: Things are getting simpler. If the Seahawks beat the Cardinals, we clinch a playoff spot, we take control of the NFC West, and we take control of the #1 seed in the NFC Playoffs. We would then be able to clinch the division with a win at home next week. If the Cardinals win, they clinch the division and home-field advantage and the Seahawks can finish no better than the #5 seed in the NFC Playoffs. Here are this week’s other games with NFC playoff implications. Teams to note are bolded. Prediction: I was talking to one of my friends earlier this week about what it will take to give the Seahawks a win in this game. We agreed on two things; the first team to score 14 points wins and/or if the Seahawks return an interception for a touchdown at any point in this game we will win. Although I do not predict a pick-six, I do believe the Seahawks will intercept two Ryan Lindley passes and the Seahawks defense will allow less than 175 yards of offense to the Arizona Cardinals. Even though Arizona will do a good job shutting down and stalling Seattle’s offensive drives, Marshawn Lynch will run for a touchdown and three Steven Hauschka field goals later in the game will preserve the victory for the Seahawks. We will take first place in the NFC West and will be in prime position to clinch the division next week. Check back late Sunday night or early Monday morning for my review of this game. Thanks for reading and enjoy this game everyone. Go Seahawks! Thursday: My flight out of Seattle was supposed to take off at 8:20am pacific time. It was the following sequence of frustrating events that really made me think back to the recent luck I’ve had while flying. Once all of the passengers were seated and strapped in, the cabin doors were about to close when it was announced that there was a water leak in one of the lavatories in the back of the plane. 5 minutes later the captain got back on the intercom to announce that we had to change planes. We all got off the first plane at Sea-Tac’s C20 gate and had to make the trek all the way to N2 in the north satellite. After standing in line again we re-boarded with no organized order so basically we boarded in the order that we had arrived to the new gate, which easily pissed off those in first class and those who had priority boarding the first time. We pulled back from the gate and after almost a two-hour delay we were in the air and on our way to Baltimore. Due to thunderstorms in the Midwest our plane was forced to do a “V” around the country. Instead of flying directly to Baltimore we flew south all the way to Dallas before turning back north into Baltimore. Of course I was seated next to an elderly couple. Just my luck. Luckily I was able to listen to music without interruption for most of the flight. There was also a family of four sitting in the row in front of me. The mom and dad were sitting in the aisle seats and every once in a while they would lean into the aisle to either seductively rub each other arms or briefly kiss. Kind of weird but whatever I guess. Total flight time was roughly 6 hours, almost one full hour longer than scheduled. After landing we headed to a shuttle that took us to an offsite Amtrak station where we would take a “MARC” train into downtown Washington D.C. After nearly an hour long wait on the train platform, we got on the train and rode it about 45 minutes into Washington D.C.’s Union Station. Upon arriving at Union Station we needed to ride the red subway line three stops to get to our hotel. After struggling for almost 15 minutes trying to figure out how to buy a subway pass, we rode the subway to Metro Center, and did about a 5-block loop to get to our hotel. After almost 11 hours after leaving Seattle, we were finally able to settle in at the hotel. After unpacking my Dad and I went down the street to eat at a restaurant called “City Tap House” and although the food was pretty good (I had a pepperoni pizza with sliced Chile peppers), the menu was somewhat sophisticated and I had a hard time landing on something I thought I would enjoy. After dinner we headed back to catch the end of Thursday Night Football between the Vikings and Packers and after the game I headed for bed in preparation for a hectic, busy, and fun touristy day on Friday. Friday: I woke up relatively early and headed down to the first floor for a full breakfast buffet that included classic options such as hash browns, eggs, bacon, sausage, and French toast. After breakfast my dad and I headed out and hit many of the sites most people go to Washington D.C. to see. In order we saw the White House, the World War II memorial, the Lincoln Memorial, the Vietnam War Memorial, the Washington Monument, the Museum of American History Smithsonian, the Museum of Natural History Smithsonian, and the Capitol building. It was a long day on my feet but it was very fun. If you were only able to see a couple of these things I would recommend the Lincoln Memorial and the American History Smithsonian. My favorite exhibits at the Smithsonian included “Food: Transforming the American Table” which showed the evolution of food in the United States, “American Stories” which was a timeline of important faces, artifacts, and inventions in American history, and “The Star-Spangled Banner” which included the original American flag from the Battle of Baltimore, which inspired Francis Scott Key to write the song which became our National Anthem. Upon arriving back at the hotel my Dad and I awaited the arrival of my uncle and my two cousins who were also coming into town for the Seahawks game. Once they arrived we went out to dinner at the Capitol City Brewing Company which was just a couple blocks away from the hotel. Capitol City’s beer selection reminded me of the Ram, as they only had four house brews and they also cycled in seasonal beers. I enjoyed the baby back ribs with a pint of their “Amber Waves Ale” and a pint of their Oktoberfest. Following dinner my friend James arrived into town and since he had not eaten since leaving Seattle we trekked to the only quality restaurant still open past midnight, a “Five Guys” about 15 minutes away from the hotel. We randomly ran into my cousin Chris who was coming back from a night out with his friends and convinced him to join us on our burger adventure. After we ate we walked back through the pouring rain to the hotel. Saturday: I woke up early on Saturday morning to work out before heading down to breakfast. Following breakfast James and I did many of the things I had done with my Dad the day before. The only new thing I saw on Saturday was the Martin Luther King Jr. Memorial which was very spacious and beautiful. After walking around the Mall a little bit more we decided to stop for lunch at Shake Shack. We had Shake Shack for the very first time back in New York in February at the Super Bowl so when we learned that Washington D.C. housed a “Shack” it was clear we had to make a stop. After devouring a double smoke shack (my personal favorite menu item), fries, and a s’mores concrete (blended custard dessert) we headed back to the hotel to rest up for what would become a very eventful night. Late Friday night James and I had bought tickets to game 2 of the National League Division Series between the San Francisco Giants and the Washington Nationals so in the late afternoon Saturday James and I hopped onto the green subway line to head to Nationals Park. I had not been to a playoff baseball game since the Mariners played the New York Yankees in the 2001 American League Championship Series so I was really excited to be a part of postseason baseball again. We then got swagged out in red at the Nationals team store before taking a lap around the inside of the stadium. Nationals Park is a relatively young ballpark and I was very impressed with the amenities it provided, the quality view from every angle, as well as the food selection. I highly recommend the pulled pork/brisket combo from Blue Smoke BBQ in right-center field. We sat in the very last row of the upper deck down the left field line and we only stayed at our seats for 4 innings because I was drastically underdressed and an intense cross breeze made it uncomfortably cold to stay in my seat as the game wore on. The game ended in 18 innings with the Giants winning 2-1 but due to plans we had made later on that night we only stayed for the first 10 innings. Even though it was disappointing we couldn’t stay, this experience was the best part of the trip other than the Seahawks game. Upon arriving back at the hotel we met up with our other friend from high school Brent and the three of us walked up 14th Street to meet our friend Amy for a night out at a bar called Café Saint-Ex. Let me say first that 14th Street in D.C. gives off a feel similar to Capitol Hill in Seattle. There are several bars and other nightlife options in the area, bringing a varied range of groups of people into the area. Café Saint-Ex reminded me of two different places in Seattle. The main bar reminded me of the front room at Finn MacCool on the Ave. The entire room was filled to capacity and it was difficult to find an open place to stand. The downstairs room was much more fun as it was a dance floor reminiscent of the top floor of Grim’s on Capitol Hill. After a long, wild dance party that included a few shots of Fireball and a few Miller Lite’s, James and I headed back to the hotel. Sunday: Thanks in large part to my late Saturday night out, I slept through breakfast on Sunday morning. Oh well, at least I was able to get a cup of coffee and a scone at Starbucks across the street once I finally got going. The bulk of our Sunday was spent at the Newseum, a museum dedicated to the history and evolution of news across all media platforms. As a sports blogger with a passion for learning about news and media I found the Newseum to be the most interesting and most fun museum I went to on this trip. Among the exhibits on display were these three that I found to be the most interesting and noteworthy. The “Berlin Wall Gallery” which included a portion of the Berlin Wall along with a timeline which told the story of how television among other media covered the events surrounding the take down of the Berlin Wall. The “FBI Exhibit” had artifacts of some of the most famous cases the FBI has ever worked on stretching from the manhunt for John Dillinger to the manhunt for Osama Bin Laden. The last exhibit that really got my emotions going was the “9/11 Gallery” which presented the September 11th terrorist attacks through the eyes of the journalists that covered them around the world. The gallery included a picture timeline of the day’s events, a theater that played a documentary of interviews from some of the media that covered the attacks up close, a wall of newspapers featuring the front page of every major newspaper published on September 12th, 2001, and a tribute to photojournalist William Biggart who was the only journalist who lost his life covering the 9/11 attacks. The tribute included never-before-seen pictures from his cameras as well as some of Biggart’s personal effects that were found in the World Trade Center rubble. We spent three hours in the Newseum which was more time than I spent in both Smithsonian’s on Friday combined. Upon leaving the Newseum and grabbing a quick lunch we headed on the subway to see the Pentagon and Arlington Cemetery. Although we did not get to the cemetery until after it closed, we were able to walk around the Pentagon and see the 9/11 Pentagon Memorial. The memorial consists of a wide gravel space along with trees and includes 125 benches in honor of the 125 people who lost their lives at this site. I found the benches to be interesting, as those that were pointing towards the building represent those who were on the plane that crashed. The benches facing the opposite direction represent those who were inside the Pentagon at the time of the crash. I am always intrigued to learn more about 9/11 as it is American history that I remember, unlike other memorials recognizing events that I have no personal memory of. Afterwards we headed back to the hotel to catch the last quarter-plus of the late afternoon NFL games. The three of us then went out to dinner and following the completion of my fish and chips at Gordon Biersch we decided to head back and call it a night. We had a busy day ahead of us on Monday and we needed to get as much rest as possible. 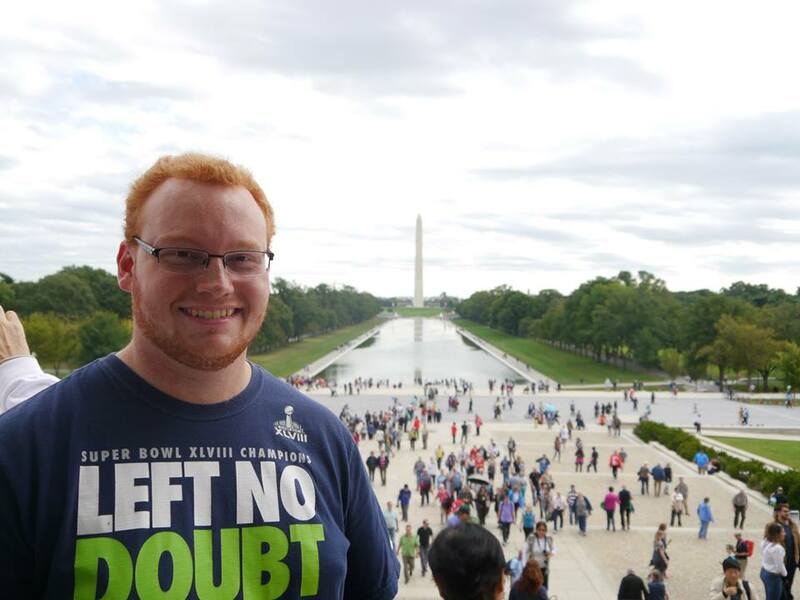 Monday: When it comes to Seahawks gameday, I am the kind of fan that treats the day like a holiday; there is nothing that I want stopping me from having a football-filled day. When the group of 6 of us decided to take a short day trip out to the Air and Space Smithsonian close to Washington-Dulles airport, I was worried that the time spent at the museum would interfere with any other Seahawks-related activities I was hoping to do prior to heading out to the game that night. If we had gone to see this museum on any other day I would have loved it even more. Although I found the Space Shuttle Discovery exhibit, the Concorde, and the various military planes to be very interesting, the fact that I was worried about being late to the game on Monday night made me kind of a pain to be around as I felt my body language made it seem like I did not want to be there. What added to this behavior was that it took two hours to get there, as we had to take the silver subway out to the end of the line with a 30 minute bus ride on top of it. Talk about frustrating. After spending only about an hour at the museum we headed back to the hotel to get ready for Monday Night Football. After grabbing a quick bite to eat at the Capitol City Brewing Company one more time, the entire group of 7 of us headed to the subway station to take the ride out to FedExField. Upon arriving out in Landover it was about a mile walk through a new residential complex to get into the stadium parking lot. We decided to head immediately into the stadium. FedExField reminded me a lot of MetLife Stadium in New Jersey. The stadium is a simple three-deck bowl that had interior decorations that were the colors of the FedEx logo (purple, orange, and green). The seats were all orange but I stood for the entire game so I have no gage to determine if they were comfortable or not. The concourses are wide but they show signs of aging. It is all concrete that gave off a vibe of older stadiums I have visited such as the Oakland Coliseum or Candlestick Park. The 12th Man showed up in full force this week. While walking around I heard several moans and groans from Redskins fans about how their stadium was being invaded by opposing fans once again. There are also a few points that need to be made about Redskins fans in general. First, Redskins fans seem to fully understand that their team is struggling and any banter between them and fans of the defending Super Bowl champions, they knew they did not stand a chance. Therefore there was almost no smack talk hurled my way throughout the game. Secondly, Redskins fans are very quick to give up on their team. After the Seahawks took a 24-10 lead with 6 minutes left in the game the majority of the crowd started to head for the exits. The game was not over by any means and the Redskins were able to quickly drive down the field to cut the Seahawks lead down to 7. A few loyal fans stuck around while showing clear anger that other fans were choosing to leave. That is something that you almost never see happen in Seattle. Lastly, it is amazing how few people I saw wearing Redskins gear around the city from the time I got in on Thursday night. I do not know if it has something to do with the fact that the Washington Nationals were in the playoffs and most fans had their full attention on baseball. I do not know if the Redskins name controversy has scared fans away of wearing Redskins gear in public. What I do know is that I walked close to 100 miles in my first 4 days in D.C. and I could count the number of people wearing Redskins gear on one hand. I found that number to be absolutely stunning. After the Seahawks sealed the win we decided to head back to the hotel. We got back around 1am and I decided to crash. Monday night had been one of the more memorable Seahawks road experiences I have had. The Seahawks made sure that the terrible feeling that followed their Divisional playoff loss to the Atlanta Falcons last season would not happen again. After earning a 13-3 record, an NFC West championship and their second NFC championship, the Seahawks are heading to what FOX Sports has dubbed the “biggest, boldest, and coldest event in history.” The Seahawks will face the Denver Broncos in Super Bowl XLVIII on Sunday afternoon. With a victory the Seahawks will earn their first ever world championship along with the Vince Lombardi trophy. The Broncos lead the all-time series with the Seahawks 34-19. Their last meeting game in 2010 in Denver where the Broncos crushed the Seahawks 31-14 in what has remained the hottest (temperature) regular season home game in Broncos history. That meeting in 2010 was Pete Carroll’s second ever game as Seahawks head coach. In the 68 regular season and postseason games since, the Seahawks hold a .603 winning percentage. This is also Seattle and Denver’s second ever meeting in the playoffs. This is what to look for and what the Seahawks must do in order to become world champions. Many wondered if Broncos quarterback Peyton Manning would choke once again in this year’s playoffs but when you are not sacked through your first two playoff games it obviously makes it easier to complete your throws, move the ball, and score points. This is the primary reason why Denver’s offense has been so successful in this year’s playoffs and it is up to the Seahawks defense to change this narrative on Sunday. Putting consistent pressure on Manning will be a big priority. In Seattle’s two playoff games this season defensive coordinator Dan Quinn has used both Cliff Avril and Michael Bennett on one side of the ball while using linebacker Bruce Irvin as a spy to read where the quarterback may be looking to throw. This strategy will be used on Sunday but I would like to see an addition to our pass rush. Chris Clemons has gone unnoticed over the past few games and he has not recorded a sack since playing San Francisco in week 14. The Seahawks cannot afford to let Peyton Manning have ample time to make his throws so a heavier dose of pass rush could make it challenging for Manning to get comfortable. It is time for Percy Harvin to make his $12 million salary this week. Harvin, who was sidelined in the NFC Championship Game while recovering from a concussion, is listed as probable this week and head coach Pete Carroll has said Harvin will be a full go. Harvin will not be limited on offense and he will also return kicks for the first time this season. There is one example of Harvin’s explosiveness that really gets me excited to wonder about his impact in Super Bowl XLVIII. Before he exited the NFC Divisional playoff game against New Orleans, the Seahawks ran a fly sweep with Harvin with the ball deep in New Orleans territory. Harvin took the snap from Russell Wilson and ran around the right side of the line for 9 yards before stepping out of bounds. It was the fastest I have seen a Seahawks receiver run all season long. This play has truly opened my eyes to what our potential on offense is this week. Throwing in Harvin’s direction is a tactic that I do not believe Denver is ready for. Look for Harvin to be a major player in the bubble screen game this week and I also would not be surprised to see him line up at obscure position such as at running back. As far as kickoffs go, I really hope Harvin gets a chance to return one, unlike against the Saints when Shayne Graham’s kickoffs went for touchbacks. If Harvin busts a kickoff return for a large gain, it will send positive shockwaves throughout the entire team and will put the Seahawks in great position for Russell Wilson to lead scoring drives. I am a firm believer in sticking with a game plan that carried you into a position like playing in the Super Bowl. However after watching film of the Denver Broncos I believe there is a facet of our offense that if we turn loose, could have significant positive consequences. Over the course of the regular season the Denver Broncos played 4 games against teams with running quarterbacks; 2 against Terrelle Pryor and the Oakland Raiders, one against Michael Vick and the Philadelphia Eagles, and one against Robert Griffin III and the Washington Redskins. In those 4 games, opposing quarterback kept the ball and ran a combined 26 times for 133 yards, an average of 5.1 yards per carry. The Broncos played a limited number of games against running quarterbacks and the Denver defense practices on a daily basis against a quarterback who is the furthest thing away from a running quarterback. I think that this could be the right time for Seahawks offensive coordinator Darrell Bevell to call a heavy read-option package for Russell Wilson to keep the Broncos defense guessing. If Wilson keeps at least 5 times the Seahawks will add solid numbers in the running game but if the Seahawks have Wilson run and the read-option continues to be highly effective, 5-10 rushes by Wilson would not be surprising to me. The read-option is an intriguing wrinkle in our playbook that could give us serious momentum and go a long way in controlling the tempo of the entire game. The biggest storyline in regards to the Denver Broncos this week is their record-setting offense against the Seattle defense, in particular the Legion of Boom. The Broncos have four weapons at the skill positions in wide receivers Demaryius Thomas, Wes Welker, and Eric Decker, along with tight end Julius Thomas; all of which have proven to be reliable targets and they all have the potential to put up big numbers if they can get open. If they can get open. Even if the Seahawks can stop Knowshon Moreno and the Denver running game they still have to deal with Peyton Manning. The key for the Broncos offense is for the offensive line to give Manning time to make his reads and make his throws because if Manning has time he is one of the best quarterbacks in the league when it comes to picking apart opposing defenses. This is why one of my three X-Factor players to watch for the Denver Broncos this week is left tackle Chris Clark. Clark started 14 of Denver’s 16 regular season games and both of Denver’s playoff games. Clark replaced an injured Ryan Clady shortly into the 2013 season but has emerged as one of the best pass blocking tackles in football, ranking in the top 10 in pass blocking efficiency according to Pro Football Focus. The Broncos can beat the Seahawks solely through the air which makes Knowshon Moreno’s potential impact on the game an added bonus for Denver. If the Broncos can run the ball effectively against the Seattle run defense, this could put Denver in a great position to win the game. The Broncos defense has one huge mission this week and that is to stop the Seahawks running game, especially running back Marshawn Lynch. The Broncos have the 8th best running defense in the league, holding opposing teams to just under 102 rushing yards per game. Given Seattle’s recent struggles in the passing game, stopping Lynch will likely determine the outcome of the game. In recent days many people have discussed the importance of the role Broncos defensive tackle Terrance “Pot Roast” Knighton will have in stopping the run game but there are other players to watch out for that will also play key roles in stopping Marshawn Lynch. My first of two X-Factor players to watch on defense this week is the Broncos leading tackler, linebacker Danny Trevathan. From the linebacker position, Trevathan really can stretch the field and contribute in all facets of the defensive game plan. He leads the team in tackles with 128, he has 2 quarterback sacks, and when Trevathan drops into coverage he has 10 passes defensed and 3 interceptions. Although he is an outside linebacker, Trevathan is the Bobby Wagner of the Denver defense. He commands the huddle and his play on the field makes him one of the best linebackers in the league. My second X-Factor player to watch on the Broncos defense is a man that may not produce the flashiest stat sheet come Sunday night but he has had recent familiarity and success playing against the Seahawks, linebacker Paris Lenon. Lenon played the Seahawks twice last season while with the Arizona Cardinals and he recorded the second most tackles among all Cardinals defenders in the first of those two meetings in 2012. Lenon will rotate at middle linebacker with Wesley Woodyard and I think Lenon can contribute significantly to the Broncos figuring out how to stop Marshawn Lynch. Along with playing in the Super Bowl come the distractions of playing in the Super Bowl. Many football players would argue about the importance of having a routine and staying in a routine game after game, week after week. This week the routines and tendencies those players have throughout the season change dramatically. They may not be noteworthy to a lot of people but to the players it could mean the difference between winning and losing the game. The most notable routine that will be altered this week is the halftime break. For all other NFL games during the season, halftime is a mere 12 minutes long, giving teams a short time to make small in-game adjustments and giving players a quick rest before heading back to the field for the second half. At the Super Bowl, halftime is 30 minutes long, so while Bruno Mars is on the MetLife Stadium stage entertaining the fans in the stadium and those watching around the world on television, the players are in the locker room trying to stay loose for the second half. Too long of a break can wear players bodies down so it is necessary to be able to stay loose while taking the extra time for second half adjustments. The team that comes out strong at the beginning of the second half may have the upper hand for the rest of the game, regardless of what the halftime score is. This was apparent in last year’s Super Bowl even though the longer intermission in that game was for the Superdome power outage; after the blackout break, San Francisco came screaming back and almost won the game. Be sure to pay close attention to the first few minutes of the second half to get an idea of which team will have the fire power to close out the rest of the game. Random Thoughts: Whether you have been following my blog since the beginning or if you’ve just stumbled on my page looking for any kind of Super Bowl XLVIII literature, of course I start with uniforms. The nice thing about the Super Bowl is that the uniform combinations are announced well before game day. The Seahawks have been designated the road team and will wear their white jerseys with their navy blue pants. This is the same combination they wore when they played at MetLife Stadium in December. The Seahawks are 2-0 in this combination this season and 2-1 all-time. The Broncos will wear their orange jerseys and white pants as the designated home team… Terry McAulay is the referee for Super Bowl XLVIII. He was also the referee in the Seahawks divisional playoff win over New Orleans… Joe Buck and Troy Aikman have the call for FOX with Pam Oliver and Erin Andrews patrolling the sidelines. Curt Menefee will anchor 4 hours of pregame coverage on FOX along with the FOX NFL Sunday crew both from inside and outside the stadium… The national anthem will be sung by renowned opera singer Renee Fleming… The halftime show for Super Bowl XLVIII is Grammy award winner Bruno Mars. Personally this is the most anticipated Super Bowl halftime show in my lifetime mainly since I am a big fan of Mars’ music. The fact that I will be in attendance to see this halftime show live is the cherry on top of the cake… Game time temperature is supposed to be clear and in the low to mid 30’s; manageable but cold nonetheless. Time to break out the layers… I am nervous and excited about getting to the game. I will be taking a train from Penn Station in New York City to Secaucus Junction, then transferring to a shuttle train that takes us straight to the Meadowlands. It’s cheaper than alternative modes of transportation and will likely get me to the game faster than if I took said alternative modes of transportation… This week is going to be nuts in New York City. I have 5 and a half days to try to do so much stuff. It will be interesting to see how crowded the city is compared to any other day… I am sure to see celebrities galore and I will post my encounters and updates on Twitter @EricHansman as much as possible so be on the lookout for those… If we win on Sunday, IF we win on Sunday my hope is to celebrate in the heart of New York City with a cigar in my mouth and a glass of champagne in my hand. That would be an amazing feeling… We are almost at 200 days since the start of training camp. It is amazing to think what has taken place since. We are one win away from the Lombardi Trophy and a world championship. Win or lose, we had a fantastic season and we should not discount that at all if we come out on the short end of this. I promise you this, Seahawks fans may be outnumbered around town and at the Stadium on Sunday, but we will certainly be louder. Take it to the bank. In the second half the Seahawks will get the scoring started with a field goal before the Broncos have the 12th Man questioning the durability of our defense. A Manning pass to Julius Thomas will cut the Seahawks lead to 3. The Seahawks will once again exchange a series of field goals with the Broncos, the last of which coming with 4 minutes left to go in the game. In a hurry up offense with the Broncos down 26-20, Peyton Manning will drive to the Seahawks 40-yard line but the Seahawks defense will step up to produce the biggest play in franchise history. Chris Clemons will strip-sack Manning and Brandon Mebane will recover the fumble. The Seahawks will run out the clock and will win their first Super Bowl in franchise history. As it turns out we HAVE made it to the Super Bowl and it HAS been a journey that we will never soon forget, which will be made even more memorable if we win on Sunday. Win or lose I am extremely proud of this team and to be a part of this amazing fan base. To all of my friends and family know this: Even though you will not be joining me at MetLife Stadium physically, I will carry you with me in my mind and in my heart and I will surely scream my lungs out on behalf of everyone I know. I will not have my computer with me in New York and I will not be home until late Tuesday night. I hope to have my Super Bowl review published by Wednesday night. Enjoy the Super Bowl everyone! Go Seahawks! This week, the National Football League will release the 2013 regular season schedule. The dates, times, and television broadcasts will be revealed to the nation. As a die-hard fan and season ticket holder this is the most exciting day of the offseason for me. I get very excited to see where and when we play our opponents and to scope out scheduling patterns to get an early look at how our schedule and season will play out. However the most exciting thing most fans get excited about when the schedule comes out is who we play on national television. Starting last season every team played at least one game in primetime. Bad teams from the previous season only got the bare minimum of one primetime game while super bowl contending teams played in primetime more often, with a couple of teams pushing the maximum of 6 primetime games. Last season the Seahawks had three primetime games coming off a 7-9 campaign in 2011. In 2012, the Seahawks went 11-5, made it to the NFC Divisional playoffs, and they currently feature some of the most exciting players in the league. In my opinion I think the Seahawks will have at least four or five primetime games scheduled in 2013. In this post I have tiered our matchups to separate which games I believe have primetime appeal and which games I think probably will not be scheduled on national television. It is a no-brainer that one of the Seahawks games against the San Francisco 49ers will be scheduled in primetime but both will not. Here’s why. The Sunday afternoon NFC NFL station (FOX) has the right to protect a certain number of games from being scheduled in primetime or being flexed into primetime in the second half of the season. Last season FOX lost out on both Seahawks/49ers games to NFL Network and NBC. To make sure they do not miss out on one of these hot matchups in 2013, I believe they will protect one of these games in 2013. The game that does not get protected will almost certainly be scheduled into primetime and I am very confident that is what will happen. 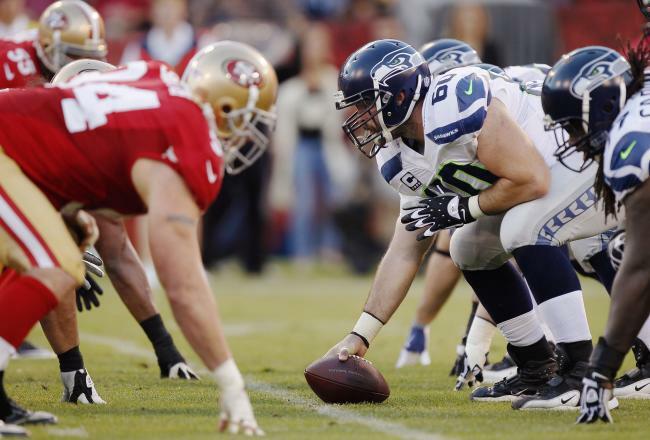 I think Sunday Night Football is the landing spot for the primetime Seahawks/49ers game this season. This season the Seahawks do not have a particularly attractive slate of home games. Having said this, the NFL likes to schedule Seahawks home games in primetime to show off the best fans and home-field advantage in the league. The only other matchup I think has a great chance to be scheduled in primetime at home is against the New Orleans Saints. The last time these two teams played was in the 2010 Wild-Card playoffs where the Seahawks upset the Saints 41-36. What could be better than putting the rematch on national television? I can definitely see this game being scheduled on Monday Night Football with Marshawn Lynch’s “Beast Quake” run being replayed during the week leading up to the game. Two other road matchups have strong primetime appeal in my opinion. The Seahawks head to Atlanta in 2013 to play the Falcons in a rematch of last season’s Divisional playoff heartbreaker. Both of these teams figure to contend to represent the NFC in Super Bowl XLVIII so it wouldn’t be a surprise if this game is scheduled in primetime. This is a game that I could see on either Sunday Night Football or Monday Night Football. The other road game I put in tier one is the Seahawks/Colts matchup. Last year Russell Wilson and Andrew Luck were two rookies who took their respective teams to the postseason. This season they face off for the first time. Two playoff teams from the previous year with two up-and-coming franchise quarterbacks sounds like a primetime matchup to me. This game I think would be perfect for Thursday Night Football. The Seahawks host the Minnesota Vikings for the second straight season and there are a couple of reasons why this game could be scheduled in primetime. Both teams made the playoffs in 2012 and the NFL usually likes to schedule primetime games between two teams who made the playoffs the previous season. Perhaps the bigger reason this game could be in primetime is because the Seahawks have become “Vikings West.” The Seahawks have both Sidney Rice and Percy Harvin who went to the NFC Championship game with the Vikings in 2009. The Seahawks also have former Minnesota offensive coordinator Darrell Bevell calling the plays. It would be cool to have Harvin play against his former team in primetime in 2013. This matchup I could see on either Monday Night Football or Thursday Night Football. The Rams could be a surprise team in 2013. They won 7 games in 2012 and have a very tough defense. Some analysts have already predicted the Rams could challenge for a Wild-Card berth in 2013. This is a rivalry that could be reborn in 2013 and putting one of our games against the Rams in primetime this season is a very real possibility. If this is the case, I think the Rams game in Seattle would be the primetime choice. Thursday Night Football could be the landing spot for this matchup. The Seahawks and Texans square off in Houston this season. Once again this is a matchup featuring two playoff teams from 2012 which the NFL will smile upon. Sunday Night Football or Monday Night Football might take a look at this game for primetime. The only other home game that could have primetime appeal is our matchup with the Tennessee Titans. The only storyline that would warrant this game to be in primetime is the return of former University of Washington quarterback Jake Locker who will be playing his first regular season game in Seattle since getting drafted. Just like my reasoning for the Rams game in Seattle, it is possible one of our games against St. Louis could be in primetime. I think it is more likely the matchup in Seattle would be in primetime but since the Rams also have a home slate that is on the weaker side, the matchup against the Seahawks in St. Louis could be in primetime. The NFL loves to schedule east coast teams in primetime. The New York Giants are one of the most common teams to play multiple primetime games no matter how good or bad they are. Even though the Giants did not qualify for the playoffs in 2012 they did finish 2nd in the NFC East and could be primed to bounce back and challenge for a playoff spot in 2013. This game’s appeal for primetime is that it is a rematch of the Seahawks 36-25 upset of the Giants at MetLife Stadium in 2011. In addition, the Seahawks will be heading to New York to play the Giants but will make it a statement that they intend to return the New York in February 2014 for the Super Bowl. I don’t think these matchups have any sort of appeal to be scheduled in primetime in 2013. The scores of most of these games will not be close, which probably won’t attract big audiences. The Buccaneers and Panthers both won only 7 games last season while the Cardinals and Jaguars combined for 7 wins last season. It would be a huge shock to me if any of these matchups are scheduled in primetime this season.